The Owandy-RX system combines precision, proven technology and simplicity. 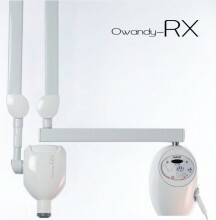 - Dentists practitioners : The Intraoral radiology system Owandy-RX gives them a reliable and tried technology. Robust, this system will optimize their radiological daily practice. - Installers : With the Owandy-RX, the installation of the X-ray unit has been rethought… and has now been made much easier. Click the button below to add the Owandy RX HF X-ray Generator For Dental Radiography Wall Mounted to your wish list.